Back on the 21st October two new navigation satellites were launched on top of a Soyuz rocket forming the first part of the Galileo In-Orbit-Validation (or IOV) constellation.� On December 10th the first signal was received by the ground station.� These signals confirmed both the correct operation of the new satellites and also the co-habitation with the existing US Navstar GPS signals. 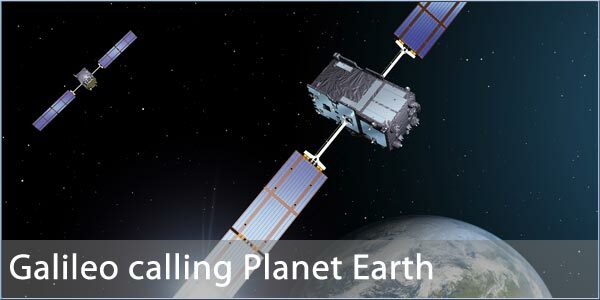 The first Galileo satellite transmitted on the E1 band which is to be used for the open navigation service.� The satellite is orbiting the Earth at a distance of just over 14,000 miles or 23,000Km.� Tests using this satellite will continue for the rest of the year before the second satellite will have its functions tested early 2012. The Galileo constellation will double next year when a further 2 satellites will be launched to complete the IOV test configuration.� Assuming everything is successful the constellation will be enhanced with further satellites in 2014 prior to the navigation system going operational later that year. Check out the ESA Galileo site and Test Signal article for more details.